Clients Brief: We would like to have us in the same clothes, shoes and apron as you did in our logo. Kirby has changed her hair to look more like mine..shorter and brown. Mine is the same length, just with a lot more blonde in it. Please draw us on the back of a red train caboose. Each one should be hanging onto one side of the train with one hand, and leaning out a bit holding our pink cupcake with the heart, in our other hand. 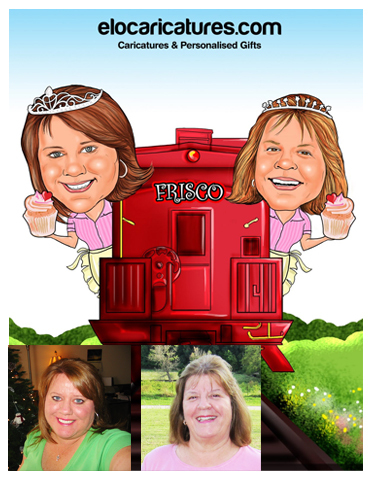 Please write the words “FRISCO” on the back of the caboose. This need to be 24” X 18” (24” is the height).